a) The martial arts were created during an era of daily mortal combat. True martial arts are the ways of killing. b) The martial arts are methods of self defense, exercise, and sport that belong in a category with many other activities that the masses enjoy. a) Kata is the essence of martial arts. It is the artistic expression of combat. Therefore the practice of kata should be approached with utmost seriousness and conviction. b) There are a number of highly effective combative styles that do not, nor ever have included kata or their equivalent in their teachings. a) The martial arts are attractive in part because of the widely accepted colored-belt grading system. Goal setting and meeting them empowers the student to push forward to meet new challenges. b) The idea that attaining a goal brings satisfaction and happiness is illusory. The practitioner should be process oriented. The path is more important than the goal. a) Once a certain level of expertise is achieved the student is expected or recommended to take on teaching duties. This is not only a form of altruism, but also fulfills a giri (obligation) to those who went before. b) Modern teaching entails some aspects that have little to do with the martial arts. Managing a business, dealing with children (and their parents), and arranging your work schedule to accomodate running a class are all par for the course for the martial arts instructor. Teaching is not for everyone. a) As a martial arts adept, you have a moral and legal responsibility to avoid conflict at all cost. This philosophy is taught and consistent within all styles. b) Physical confrontations can happen in a heartbeat and frequently without warning. There's simply no time to mull over ethics or the threat of lawsuits when some hoodlum is trying to boost your wallet. a) At a time of suicide bombings, drive-by shootings, and global terrorism of epidemic proportions, the study of the martial arts and ways have become a futile vestige of a time past. Its use and aims have become outmoded. b) Societal change on a global scale can only begin one person at a time. The ultimate goal of the martial arts is to direct the practitioner toward peaceful ends. We need them now more than ever. I believe in seeing as many sides to an issue as possible. I'm not suggesting being a fence-sitter on certain matters either. Being overly broadminded could cause one to take perspective to a distorted dimension; akin to viewing a work of cubism - an art form based on the depiction of multiple and twisted spatial relations. In this manner true understanding becomes muddled and lost. Our opinions and beliefs are not necessarily written in stone. What we hold as true today can change tomorrow. There are as many sides to a so-called truth as there are those to perceive it. I enjoyed your compilation of thoughts. We discuss these topics before class a few times a month, and I enjoyed reading someone else thougts on the subject. I find forms/kata one of the best ways to learn, although I know quite a few people who find them boring. I think it depends on how you are approaching your style. If you approach it as a sport, then forms/kata can seem like a waste of time. Since I have been studying Taekwondo for the last five years, I've seen a lot of people come and go from our dojang becuase of this. Or so it seems. Our school also promotes ranks slowly, which could be another cause. You hit the two sides of the coin quite well. It has an article on Kata (Kaho) you would find most interesting. I have a shorter post just on some aspects I felt relevant at my blog. Have a great day and keep up the great posts. "The purpose of our study is for natural instinct resemble the dragon." Actually, that may be an indicator you're in a good school. One way schools (McDojos) retain high memberships is to promote students through rank quickly and to gloss over material so students don't get frustrated and/or bored. Admittedly though, training at times (in the right school) can be difficult and tedious. Kaho - that's a new word for me. I'll check out that post. 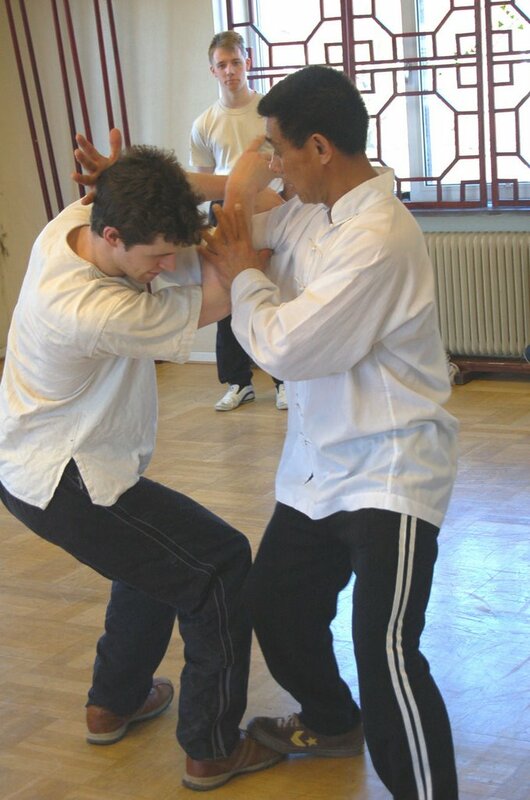 The dragon is a recurring theme in the martial arts. The Isshinryu symbol - Mizu Gami - is half woman/half dragon. well written, you forgot to capture it's spiritual essence. I love kata, people who thinks it's boring probably don't understand it. that made me smile. My father's stronger than your's. It also reminded me of self-defense drills that are repeated and repeated and repeated until it becomes a reflex in the army. Kata or no kata, what's more important is the use/utility of the thing. Or... the actual training done with the tool. Loosely done partner drills give the same result as loosely done kata... Train how you want it to be. "I believe in seeing as many sides to an issue as possible." That reminds me of my philosophy classes. Love of wisdom. Great pov. Can't help but think os Sartre: "there is always choice"
I've never thought of katas as boring. I'm too much of a perfectionist, I guess. But there was always work to be done on them. I found the memorization great exercise for my brain as well. My favorite response when someone starts arguing for one or another of these points of view is to tell them: "I'm not an either/or person, I'm a both/and person." Or to quote somebody (I have no idea who anymore) "Most real truth is only expressible in circular paradox." I agree. There's no such thing as boring kata, only boring practitioners. what's important is the use of (kata)...Train how you want it to be. Sartre was a warrior in his own right. My father's stronger than yours. Reminds me of a nice story. Don Nagle ran an Isshinryu dojo in New Jersey for 40 years before his death in 1999. He's credited with saying to every youngster in his school: "I can beat up every man in the world. Except your father." Actually, its much easier to remember techniques by rote (as in kata), than if you tried learning all the moves separately. In my opinion, this is one of kata's finer points. Arguing or defending one's point of view is fear-based and egotistical. I like your response. Most real truth is only expressible in circular paradox. That's a nice one. If you get a chance, find out who said it and get back to me. ...an unquestioning mindset is an accepted part of training. It used to be like that. There was a time in traditional karate (probably other arts as well) when it was actually discouraged to ask questions; as if doing so was bad etiquette or disrespectful. Maybe it was so the student would figure it out on her/his own terms. Fortunately that's all changed. The sign of an enthusiastic student is one who does the asking. Well, I made it through my first Tai Chi class. Some pain involved but, I'm taking it class by class to see how my body holds up. Regarding the last paragraph, seeing as many sides as possible - I received some very good advice from one of the senior managers in our company. He told me not to be in an unnatural hurry to reach a conclusion. While we always have to keep our deadlines in mind, when we can, try to slice up a situation into as many different angles as you can. Turn it inside out. You may not come up with answers, but you are likely to come up with understanding, which in the long run, may turn out to be more important. I believe Budo is not a fighting, it is the way to improove your Spirit. and the purpose to study Budo is the way to understand How to prevent a fight. I agree with most of your statement. It's true that budo is more than just the art of fighting (bujutsu). But I believe that to say budo is "not fighting" or "not about fighting" is somewhat misleading, even though its aims are ultimately peaceful. I admit, it's a weird dichotomy. Thanks for your comment. Great post. Loved the concept of apparent contradiction. Yin and Yang are actually part of the same whole - I think that gets forgotten sometimes. Rick - loved what you said about understanding being the ulitmate goal, not necessarily answering a single question! Thanks for that. Actually I had the yin and yang concept in mind for this post. It's interesting how many things are dependent on their opposite to be defined or even exist (e.g. good and evil).